Alchemists never delivered on their dream of turning lead into gold. But scientists have figured out how to turn common garden and kitchen waste into fertile material for your garden, which is close enough. The simplest way to gain that nutrient-rich material is by piling common organic waste outside and turning over your compost occasionally. But if you want get more homemade fertilizer, you’re better off just building a compost bin. Since they’re just a wood box, you can put one together so long as you’re able to swing a hammer. 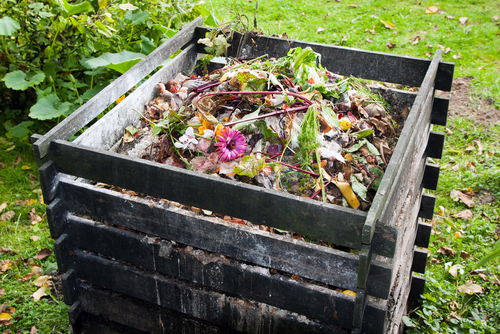 Here’s what you need to do in order to make your compost bin. You really have two options when building your compost bin. You can either buy fresh wood at your local hardware store (or lumber yard) and cut it to length, or get four or five wood pallets. Both are fine. A compost bin is designed to keep trash in place, not help you sail across the Atlantic. A little imprecision isn’t going to hurt you as long as you end up with something that is roughly square and won’t blow over the first time it rains. Four 4 x 4s cut to three feet in length. Sixteen 2 x 6s cut to three feet in length. 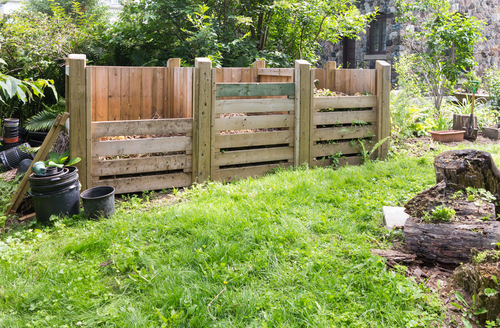 You don’t have to actually cover your compost bin. But some prefer to cover it in order to keep racoons out and retain heat. Nail one of your 2 x 6 boards to the bottom two 4 x 4 boards. The 4 x 4 boards are the corners are the structure. Two nails positioned three or four inches apart on each side of the board are enough to keep it in place. Allow for a few inches of space (like in the compost bin above), and nail down the second 2 x 6 board. Eyeball roughly the same amount of space, and nail down the last two. Congratulations! You are one quarter of the way toward convenient compost storage. Now that you've already got some experience building the first wall, the second one should be easy. Just use your last two 4 x 4s and repeat step two. This step is easier if you have someone helping you. Stand the two walls up and connect them at the bottom with nails and one of your 2 x 6 boards. Now it should be able to stand up on its own, so nail in the remaining three planks to complete the third wall. With three walls in place, you know what to do. Nail the final four 2 x 6 planks on the opposite side to complete your compost bin. If you want, nail a section of chicken wire to the inside wall of your compost bin. This will prevent your compost from spilling out when the bin starts to fill up. Want to turn your compost bin into a compost warehouse? If you have a hefty sized garden and plenty of organic waste, you might consider creating a few of them. 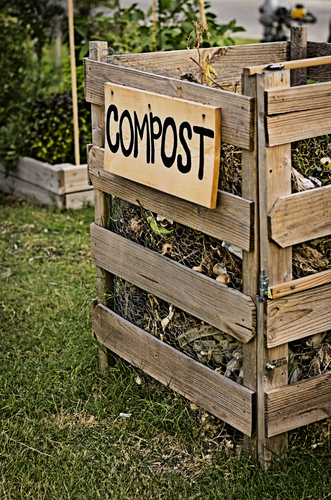 What can you put in your compost bin? Technically, all organic material will decompose eventually, but you should focus on will give you the best material the fastest. Prime compost materials include green clippings, twigs, sawdust, cow or chicken manure, and fruits and vegetables you intended to eat, but started rotting before you could. Less favorable is old meat, bones, and dairy products. Greens, like grass clippings or leaves, are rich in carbon. Browns, like twigs or sawdust, are rich in nitrogen. Ideally, you want to have a 50/50 mix of both of them. But don’t worry if your ratios are a little skewed to one side. Want to give Mother Nature a helping hand? Send all your materials through the shredder before you dump them in your compost bin. This gives bacteria more surface area to work with, and breaks it down more quickly. The more bacteria thrive in your compost pile, the faster it will break down. That means warmer temperatures and lots of moisture to keep the bacteria thriving. If your compost pile gets too dry, spritz it with the hose. But remember, the idea is just to get it damp, not totally soaked. Take a stick or a rake and mix up the compost. That gives all of your materials a chance to decompose more evenly. "Since they’re just a wood box, you can put one together so long as you’re able to swing a hammer." Microfibers are so intertwined in the fabric of our lives that virtually all of us are part of the problem.